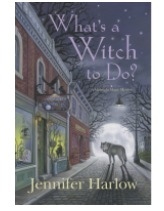 What is a Witch to Do? | Michelle Writes!! Mona McGregor’s life has just become complicated. That is considering she is the High Priestess of the local witch’s coven, runs a shop, raising her her two nieces and is single (not that she wants to be). NOW she has a a werewolf living her house and fixing up her shop, a local doctor who has fallen in love with her and . . . oh yeah . . . someone is trying to KILL her! The entire concept of the book is great! I think most people will like the book as a casual read. I like book where the main character has special gifts. However, the main character, Mona is a high priestess and really wasn’t until about three quarters through the book that I understood why. Oh, the author did tell us how she became High Priestess, but I had to agree with her enemies’ at some point that I truly did not understand why. When the book does pick up, it really picks up and the reader will enjoy it. A number of books that first in a sequel have this problem where the author spends a lot of time introducing everyone. I really wish they would treat it a a stand along book so that when the sequel comes along we can get to the meat of the problem, right away. In this book, I really would have liked to know more of the backstory from the get o rather than have bits and pieces given to us. I remember reading somewhere that the the reader should have as much about the situation as the main character and in some ares of the book this is true, however, I felt like Mona was holding some things back, such as the true extent of her gifts and her nieces gifts. Read the book, I do like the author and have read books from her before. This entry was posted in book review and tagged book reviews, reflections by learnbyme. Bookmark the permalink.